Despite all the promises of the infamous paperless office, the days of faxing and printing are far from over. Luckily, both processes have become easier than before—even if you happen to be working on a device that, like the iPad, cannot be connected directly to a printer or a phone line. True, with today's portable devices you may not have a direct connection the 1980s, but there are plenty of developers that would love to take some of your money in exchange for the opportunity of printing and faxing from your mobile device. First up is PrintCentral for all your printing needs, which has been redesigned to take advantage of the new capabilities of the iPad. The app—which also supports the iPhone and iPod touch in a Universal package—allows you to view documents in all sorts of formats, including Microsoft Office, and transfer them to your desktop computers. In addition, you can print your documents out through a shared printer, which you can connect to your via either Wi-Fi or 3G/EDGE (although the latter won't be available to iPad users until the 3G version of that device goes on sale later in April). PrintCentral is much more than a printing utility—it is a veritable office center, complete with integrated mail client, Web browser and photo viewer, all print-capable. PrintCentral developer EuroSmartz has also announced that all its other iPhone OS applications have been updated to support the iPad by converting them to a Universal format that automatically detects the type of device you run them on and adapts its user interface accordingly. PrintCentral is available as a Universal app from the App Store for $10; it works on any iPhone OS device and requires iPhone OS 3.2 or higher. 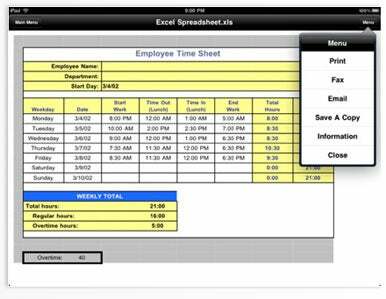 Separately, Ndili technologies has announced a new, iPad-only version of its Fax Print & Share app. Like PrintCentral, Fax Print & Share provides full-screen support for viewing documents in a multitude of formats and, in the Pro version, allows you to share them via e-mail or the Web. The app also supports direct printing through FedEx Online and faxing through its own service, which can be used on a pay-as-you-go basis through in-app purchases (four “fax units” are included in the initial purchase price of the app). If home or office printing is what you're after, the app can be of assistance through any printer available on the network, whether it’s shared through a desktop computer or standalone. Fax Print & Share is available from the iPad store for $6 and requires an iPad running iPhone OS 3.2 or higher. Like its iPhone/iPod touch-only cousin, the app also comes in a Lite version, which costs $2 but can only store seven documents or folders, and in a Pro version, which includes the ability to browse and download files from e-mail or the Web and costs $9.